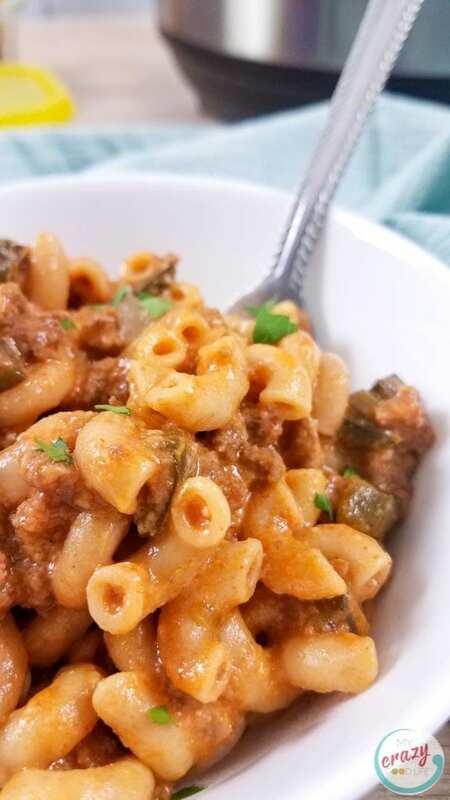 This homemade hamburger helper with green chilies is spicy and delicious! Just as easy as the boxed stuff, but healthier and tastes better! 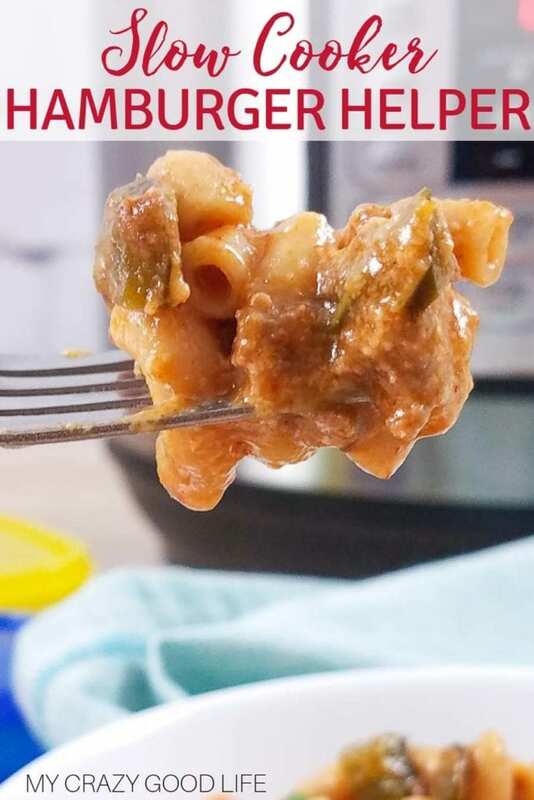 This Cheesy Mac is a great family friendly meal that you can make as spicy as you like. 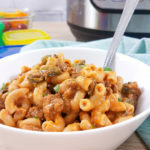 Can I make this cheesy Hamburger Helper in the Instant Pot? Brown the ground beef in the Instant Pot using the sauté function. Add the onions, green chilis, paprika, salt, and garlic powder. Give it a quick stir. Next pour in the macaroni, beef broth, and tomato sauce. Make sure all the pasta is below the liquid if you can. Close the lid and turn the pressure valve to sealing. Cook on high pressure using the manual setting for 3 minutes. Release the pressure using the quick release method. Remove the lid and turn the Instant Pot off. Mix in the Greek yogurt and cheese until the cheese is melted. We calculated the containers with greek yogurt and cheese included. The nutrition facts are calculated without the dairy products, it’s how we prefer to make it but I understand some people like the cheesy version! 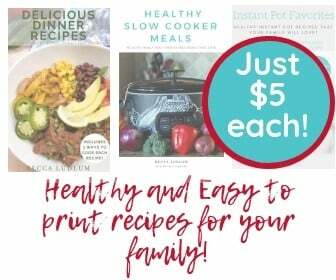 Do you have more healthy recipes like this for me to try? 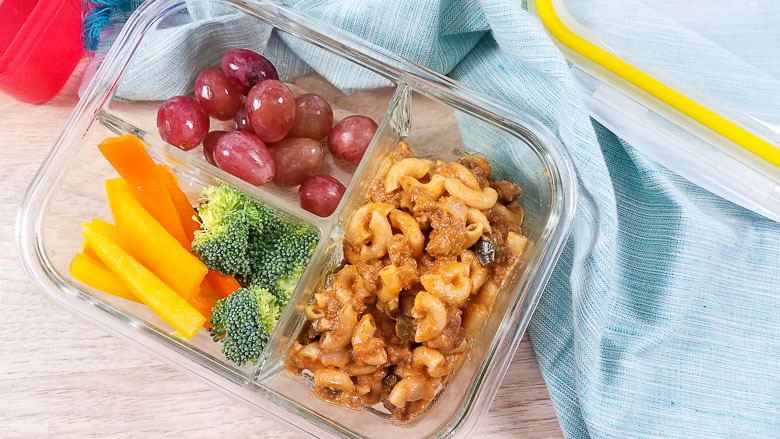 Is this spicy Hamburger Helper 21 Day Fix friendly? It sure is! Here are the Portion Fix / 21 Day Fix counts. 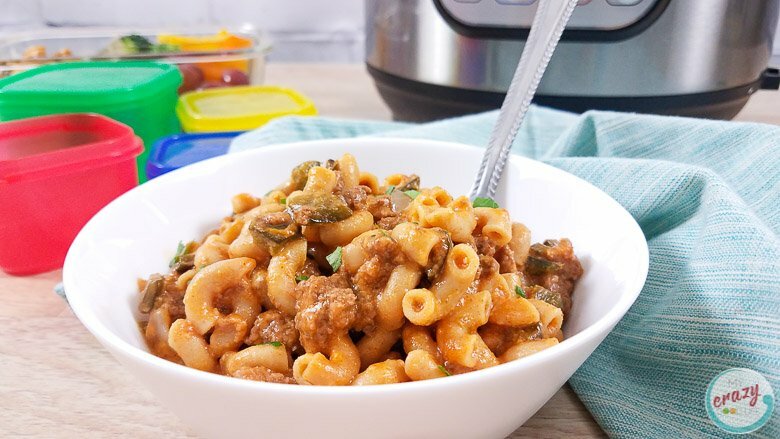 To reduce the spice in this hamburger helper recipe, use green peppers instead of green chilies, or find mild green chilies to use. 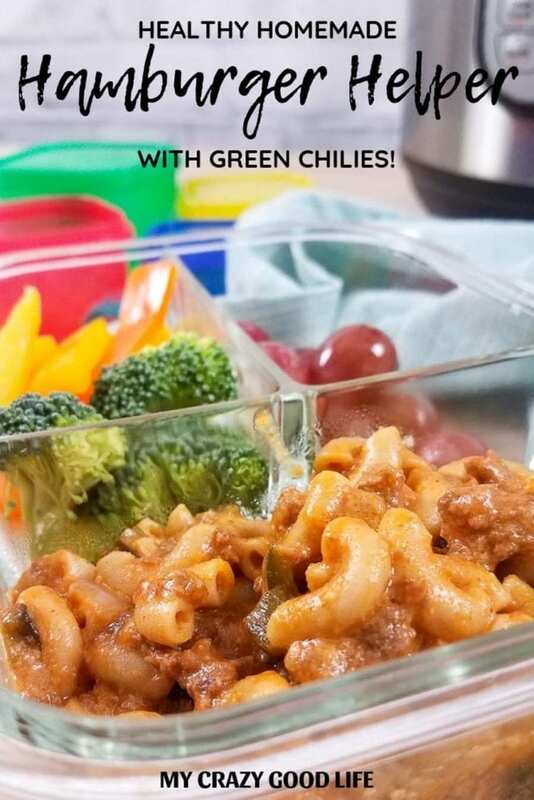 Green chilies can get super spicy–make sure to test this delicious recipe before giving it to the kids! 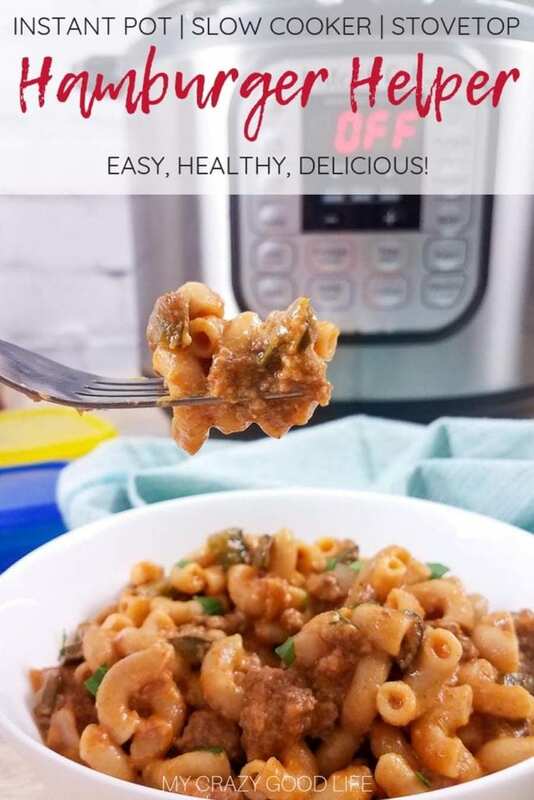 Can I make this Homemade Hamburger Helper recipe dairy free? I’ll be honest and tell you that I don’t care for dairy, so I often make this without adding the greek yogurt! Skipping the greek yogurt makes this delicious dish dairy free. Containers were calculated with Greek yogurt and cheese included. Nutrition at the bottom is calculated without Greek yogurt and cheese. Is this a slow cooker meal? I seriously love how the slow cooker can work all day just to make you dinner. It’s perfect for those with little kids running around too! 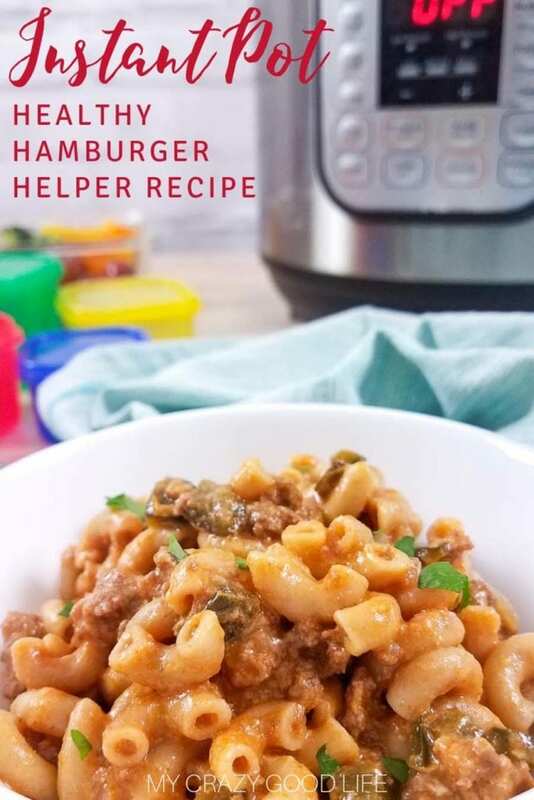 Here are the crock pot directions for this healthy hamburger helper recipe. Brown the ground beef in a large skillet on the stove. Transfer the cooked ground beef to your slow cooker. Add all the remain ingredients to the slow cooker except the Greek Yogurt and cheese. Cover the slow cooker and cook on high heat for 2-3 hours, low heat for 4-5 hours, or until the pasta is tender. Remove the lid and mix in the Greek yogurt and cheese. You can leave these out if you want, it’s how we usually make it and the nutritional information is calculated without the dairy! 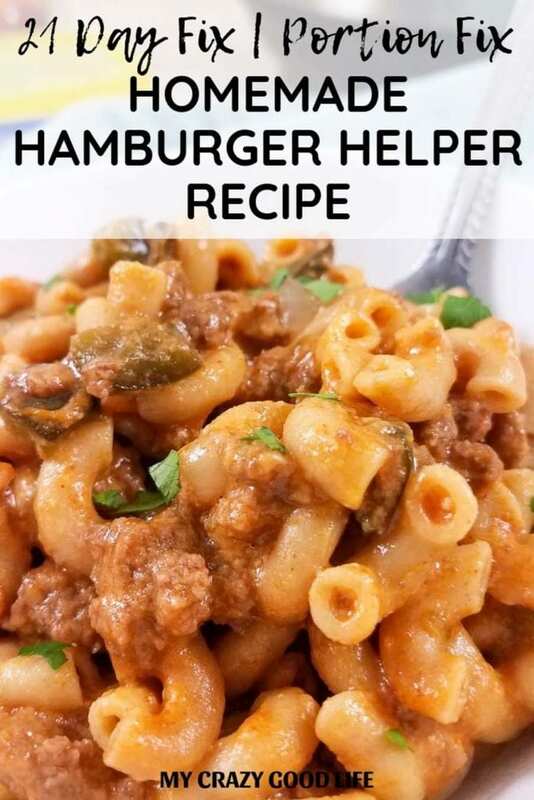 Can I make healthy Hamburger Helper on the stovetop? Next pour in the macaroni, beef broth, and tomato sauce into the skillet. Make sure all the pasta is below the liquid. Bring the liquid to a boil, then cover and reduce the heat to medium low. Allow the pasta to cook for 10-15 minutes until the pasta is tender. Stir occasionally as needed. Remove the lid and mix in the Greek yogurt and cheese. Mix until the cheese is all melted. The yogurt and cheese is optional, this recipe is delicious either way! We calculated the nutritional information without it, it’s how we prefer to make it! 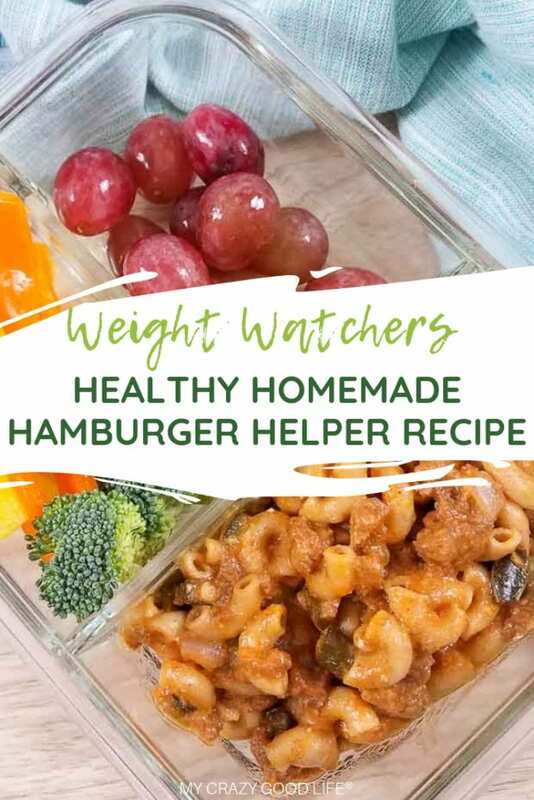 Do you have Weight Watchers Points for this healthy Hamburger Helper? Yes! Each 1 cup serving using 99% fat free ground turkey and fat free plain greek yogurt low fat cheese is 3 freestyle smart points per serving. If you remove the dairy from this recipe (which is actually how I prefer it! ), it counts as 2 freestyle smart points per serving. Next pour in the macaroni, beef broth, and tomato sauce. Make sure all the pasta is below the liquid. Remove the lid and turn the Instant Pot off. Mix in the Greek yogurt and cheese until the cheese is melted. Garnish and serve. Remove the lid and mix in the Greek yogurt and cheese. Mix until the cheese is all melted. Garnish and serve. Remove the lid and mix in the Greek yogurt and cheese. Garnish and serve. Containers were calculated with Greek yogurt and cheese. Nutrition is calculated without Greek yogurt and cheese. Weight Watchers Freestyle SmartPoints: 1 cup serving, using 99% fat free ground turkey and fat free plain greek yogurt low fat cheese is 3 freestyle smart points per serving. If you remove the dairy from this recipe (which is actually how I prefer it! ), it counts as 2 freestyle smart points per serving. Your tips were so helpful! Thanks for the delicious recipe, my family loved it!! LOVE IT! Total cozy comfort food! I could curl up with a bowl of this at least once a week – thanks! I love how simple this is! Hamburger Helper is rare in our house, but I must admit that sometimes it is made. I usually have some in the cabinets for just in case the day gets too insane and I am not prepared. This does sound like it is just as easy as going through the boxed and without all the added preservatives! I do not have an Instant Pot, tho it will probably very soon be my newest addition (I probably don’t NEED it but well you know lol), but I have the Ninja Auto IQ which is a multi cooker. I can probably adapt the recipe to that. In the last 2 comments it said you changed the recipe to 1 c pasta and 1 c broth. The recipie reflects neither change. So is the recipe correct 1cup each or 2cups. and does it change the ww points if it does change? Thanks.